This is the film that they cut Kevin Spacey out of. Following the numerous allegations of sexual assault levelled against the actor, Spacey’s scenes were excised from the film. 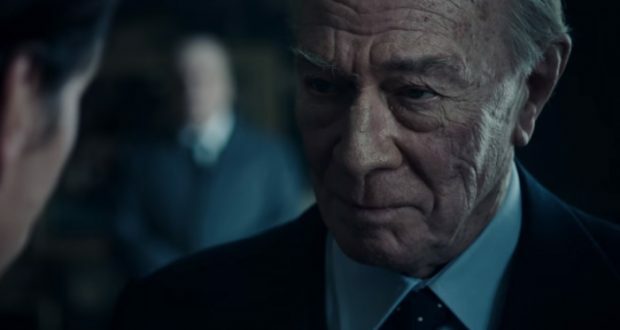 Recasting Christopher Plummer in the role of oil tycoon J. Paul Getty, the scenes were reshot with barely a month to go and the studio paid through the nose to rush the print through production. It is often the case that behind-the-scenes drama of this sort overshadows the film itself. I am surprised to say that I rather enjoyed All the Money in the World and it has emerged from these issues pretty much unscathed. In 1973, Paul Getty is kidnapped in Italy. The kidnappers demand $17 million. Despite the protestations of the boy’s mother Gail, his grandfather – the oil magnate and richest man in the world, J. Paul Getty – will not pay a single penny. With a stalemate and her son’s life in the balance, Gail must mount a desperate campaign to keep the lines of negotiation open and barter with her implacable father-in-law. Christopher Plummer’s subbing in is for the better. Aside from the fact that we get to see a brooding and sinister Plummer in action (always a treat! ), he does also bare a resemblance to the elderly Getty patriarch. 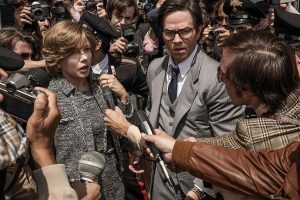 If you hunt down the older trailer for All the Money in the World with Spacey in them, he is wearing a withering amount of prosthetics and does not resemble a human, let alone Getty specifically. Beyond one CGI composite shot that still works fine, there’s nothing in the film to suggest it had a rocky or rushed final sprint to completion. Quibbling over the Spacey heritage aside, the film has much to recommend it. Even when paired with a lumpen or messy script (Prometheus, for example), Ridley Scott films always look great. His catalogue may vary but the quality of production is never in doubt. Coupled with cinematographer Darius Wolski, All the Money in the World looks sumptuous with its evocative lighting. This is overlaid with a very good score, which really comes into its own with the dark leitmotifs that precipitate Getty. Even when Plummer is being pleasant and affable, there’s a very precisely judged element of foreboding that penetrates the music. Acting-wise, Plummer is a domineering figure in the film but is deployed with restraint. He steals every scene he is in but the eccentric and maniacally frugal overlord is kept at some remove so that his character can be teased out. It’s also sensible given that it is very har d to construct a drama out of someone implacably doing nothing. Most of the film is therefore carried by Michelle Williams as Gail. It’s the harder role and the less flashy of the two but her efforts pay dividends. There’s a transparent effort to curry awards favour here but it would hardly be undeserved if Williams did win. Mark Wahlberg by comparison is flat. Playing Getty’s agent and negotiator Fletcher Chase, Wahlberg does not have a great deal to do. The lack of activity in his character points to the overriding flaw with the film. 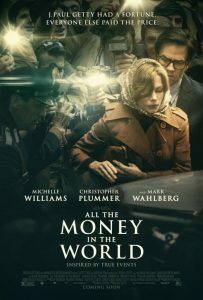 All the Money in the World spreads itself too thin to compensate for the dramatic hurdles of a stalemate. This couldn’t be a tense negotiation drama because of the protracted nature of events. The danger is then that the film would sag when the characters wait on either a response from Getty or the kidnappers. We dive into some messy character dynamics to propel the film – a good approach – but none are tackled with quite sufficient depth. The film is indeed entertaining with great performances, but lacks the focus on one or two key strands to really achieve greatness. The battle of wills between Gail and Getty is fraught but not titanic. 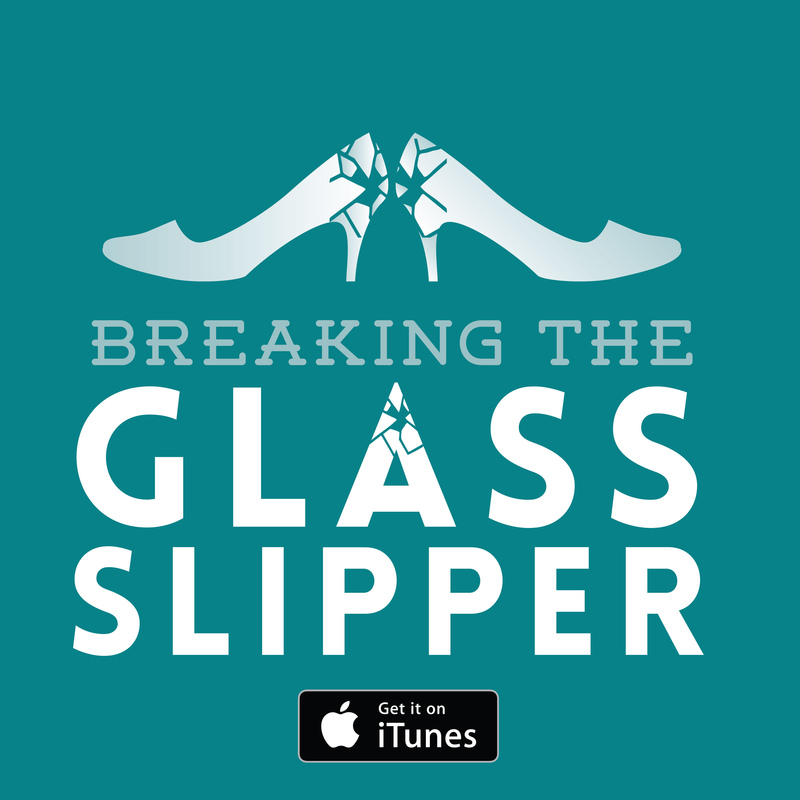 The relationship between Paul and his kidnappers is intriguing but not riveting. The backstory of growing up among the Getty’s is illuminating not insightful. And then we have Wahlberg, ostensibly there to play the man protecting Getty’s interests throughout the whole negotiation. A negotiation that never really becomes the central point of the drama. He’s a victim to a slightly shallow and unfocussed story. Verdict: A very good film resting largely on the strength of its performance, that has overcome the aftermath of Kevin Spacey.